I’m always amazed at the end of each year as I look back and realize all that happened in the past 365 days. Obviously 2015 held even bigger changes than previous years as I announced my pregnancy at the beginning of the year and gave birth (amid some ostomy drama) to my son. And if that wasn’t enough, in my personal life, we settled into our new home that we moved into just before the beginning of the year, I decided to leave my full-time job in favor of working from home and getting to spend time with my kid, and celebrated 5 years of marriage to my husband. I thought I’d take this chance to highlight some of my favorite posts from the past year. I actually had a hard time narrowing this down because there were a lot of posts that really meant a lot to me this year. It’s pretty pregnancy / baby dominated, but I’m OK with that! 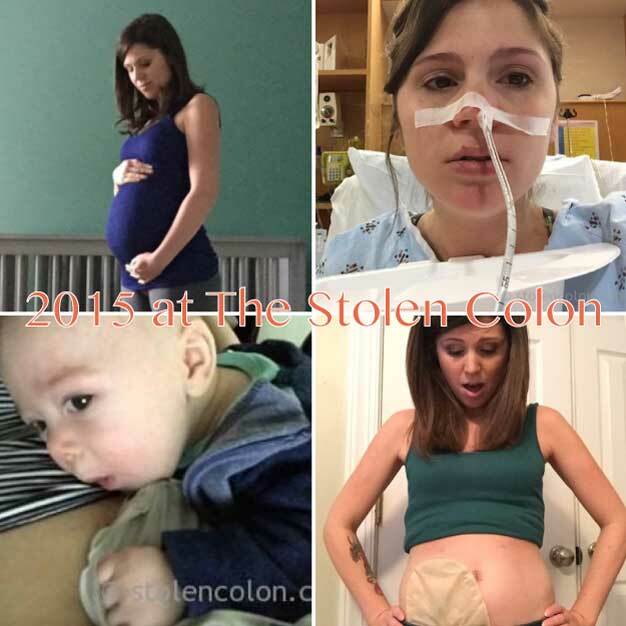 This entry was posted in Inflammatory Bowel Disease, Motherhood, Ostomy, Pregnancy, Stolen Colon, Surgery, Ulcerative Colitis and tagged 2015, blog, colectomy, colon, colon bag, Crohn’s disease, health, hospital, IBD, ibd blog, ileostomy, ileostomy bag, ileostomy blog, life, memories, NG tube, ostomy bag, ostomy blog, pain, parenthood, recovery on December 31, 2015 by Stephanie Hughes. Tomorrow starts off Invisible Illness week. As many of you may know, Crohn’s disease and ulcerative colitis are considered invisible illnesses because you can’t always tell what an individual is dealing with based on what is visible or how they look. The images I included in this post were all taken at times that I distinctly remember how bad I was feeling. You can tell in some of them more than others, but after living with a chronic illness for so many years, I have gotten pretty good and disguising how bad I may be feeling at times. 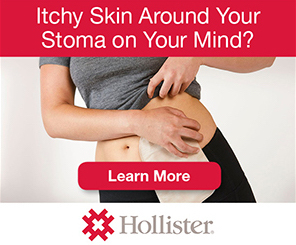 As I was thinking about Invisible Illness week, I was reminded of an interesting discussion we had at my ostomy support group a few months back. 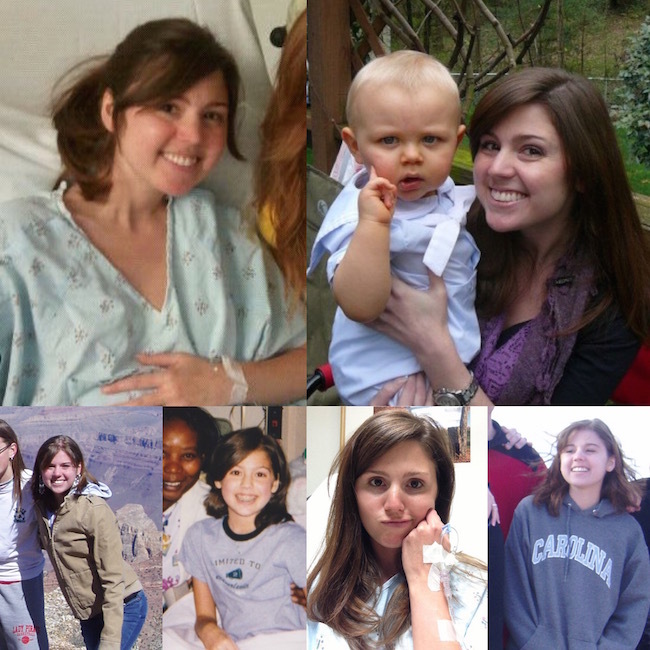 We talked a little about the thoughts that we all dealt with when we first knew we’d have to have surgery to get an ostomy and about the grief that is felt over the loss of a part of yourself. We finished up by discussing what we actually went through and how we made the decision to keep going. It wasn’t a lecture on what’s the right way to handle all of this, but simply a discussion of what we each had experienced. At the meeting, a couple of people started talking about everything that they had been through and one guy listed off a dozen or so surgeries he had previously had for various reasons and finished by saying that he knows people who are much worse off. A lot of people starting chiming in about how somebody else always has it worse and that provided encouragement to keep going. I know that it is true that others have it worse than me. I fully admit that. On a regular basis I am faced with someone new who has been through so much that my surgeries and medications and hospitals stays and pain all seem very small. But I really don’t think that’s how we’re supposed to feel. I think we (and by “we” I mean the patient/health community and maybe even society in general) have gotten too caught up in the “who’s got it worse?” game. First of all, there is absolutely no way that judge that and secondly, I don’t understand why we all feel the need to try to judge it. We attempt to categorize the level of awfulness that each person has to deal with when, in all honesty, we are in no position to make that kind of assessment. Who’s to say that the person with the severe illness but a strong support system is any better or worse off than the person who has a mild illness and is all alone? All of our stories are so complex and interwoven into so many aspects of our lives that, unless we are in that position, we can never know what it’s like. There is definitely a certain level of understanding that is present amongst people with the same diagnosis and even in people who are living with very different issues, but can understand chronic illness in general. But there can never be a complete understanding of another person’s journey. Symptoms that are simple for one person to deal with may send another person into a deep depression. I know it’s hard, but I think we need to stop comparing ourselves to everyone else and start seeing what we all really have in common. Part of what I love about being involved in the IBD & ostomy community is that I feel like we all see each other for what we have in common and that creates an intimate bond between us all. But even for those who are not living with Crohn’s disease or ulcerative colitis, chances are they also have something they are dealing with and learning to live with. Just because we don’t know what it is doesn’t mean it isn’t there. We all have some sort of invisible “illness,” regardless of whether or not it is actually classified as an illness in the true sense of the word. We all have some sort of cross to bear that helps define who we are. It could be a diagnosable disease or an anxiety disorder or a troubled marriage or difficulty making friends. We all have something that we must try to overcome in this life. And whatever it is may be visible to others or may stay hidden, but that doesn’t mean it isn’t there. So regardless of whether you are living with an illness or dealing with some other difficulty in life, I encourage you to not think about who has it worse, but rather to remember what we all have in common. This entry was posted in Inflammatory Bowel Disease, Ostomy, Stolen Colon, Surgery, Ulcerative Colitis and tagged chronic illness, colectomy, colon, colon bag, community, Crohn’s disease, health, hospital, IBD, ibd blog, ileostomy, ileostomy bag, ileostomy blog, Invisible Illness Week, ostomy bag, ostomy blog, pain, surgery on September 27, 2015 by Stephanie Hughes.